Browse Smith Rock climbing routes by grade and type (Sport or Trad/Mixed routes) below. More routes are being added as we climb them. Find route descriptions, images, and area information for each climb. 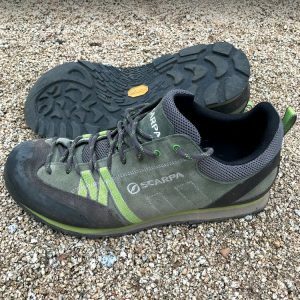 The Scarpa Crux approach shoe has been around for years and is one of the go to approach shoes on the market. If you hang out in a gym or crag for a few minutes you’ll likely see a pair or two go walking by. Like most approach shoes, they offer a beefy and sturdy construction with proper stiffness. If you’re in the market for an approach shoe, give the Scarpa Crux a try. We promise to limit the spamming. Hell, we might even run a contest or giveaway from time to time.